New Year’s Resolutions… I might not make them every year but I certainly think about making them. The one New Year’s Resolution I’ve at least thought about making every year since I was six or seven (and saw a fabulous, tall American-looking woman step onto a curb and call a taxi with Panache with a capital P), is learning to wolf whistle. People have tried to show me over the years – there’s a trick with curling the tongue like a tube, apparently – but so far narry a piercing toot has come from me. Perhaps 2011 is that year. Oh, and 2011 is also the year that I’m going to concentrate on writing the first half (why stop at half?) of a story about Italy that I’ve been thinking about for the past four years. Let this one at least not be like the New Years Resolutions I’ve ignored every year. Let “thinking about” be “acting on” too. This entry was posted in Books, Colours, Italy, Jewels, Stories and tagged 2011, new book, new year, resolutions on December 31, 2010 by victoriafinlay. The biggest diamond in the world? Ever? There are no pictures of the great Braganza diamond, and nobody knows quite where it might be. But here’s the story, and the mystery. In around 1790, three criminals were banished “into perpetual exile” in the interior of Brazil. The rule was that they could not go into any big towns – and if they did so, they would be imprisoned for life. The three men decided to try their luck mining in the Rio Plata area, hoping that a big find of gold might reverse their fortunes and maybe even, with some bribery funds, their sentences. In 1797, after six years of searching (and avoiding cannibals and government soldiers on the way) they came to the river Abaite. It was a drought and the waters were at their lowest levels known in living history. While panning for gold they were surprised to find, in one of the pans, a stone of excellent heft that weighed nearly an ounce. A clergyman helped get them access to the governor at Villa Rica who consulted a jeweller to decide whether the stone was or was not a diamond. It was decided that it was, and the men were pardoned. It does not appear that they were allowed to keep the jewel. It was called the “Braganza”, after the Portuguese Royal House of Braganza. 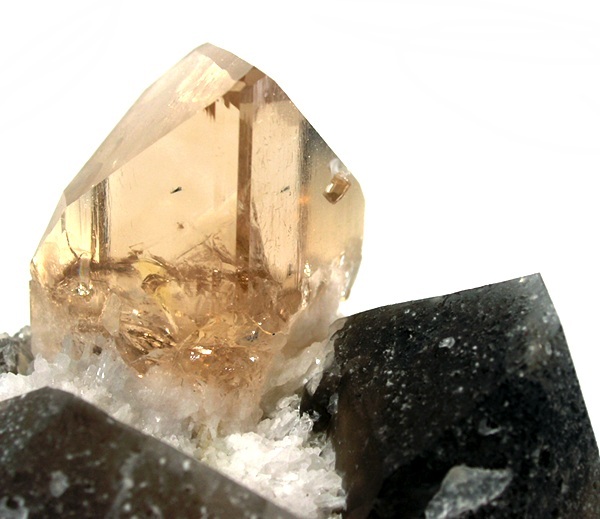 However now the stone has disappeared from sight, and it is believed by many experts not to have been diamond but topaz. A final note on the Braganza, Portugal has not has a King since 1932, when its last monarch, the exiled Manoel II, died at Twickenham, after a day of watching tennis at Wimbledon. More on topaz on the latest “The Ones that Got Away” page. 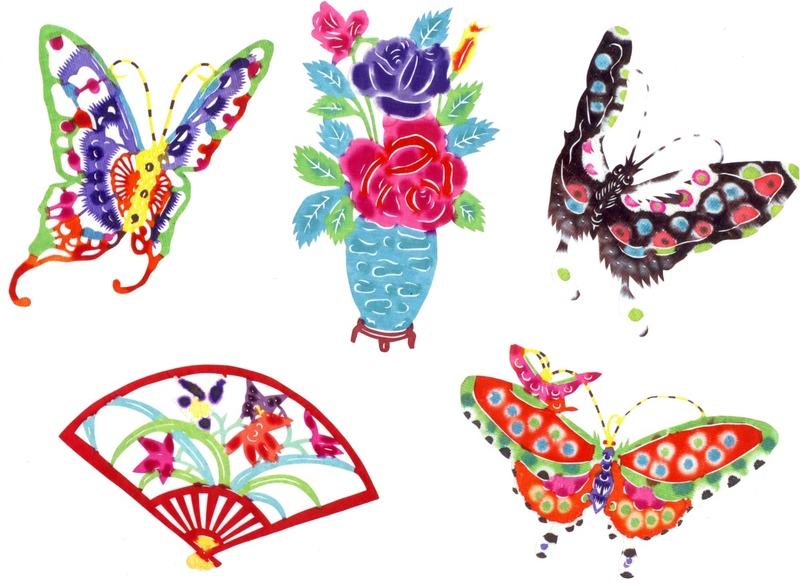 This entry was posted in Books, Brazil, Brilliant, Jewels, Stories, Topaz on December 18, 2010 by victoriafinlay. I’ve just looked back at my old notes on garnets – thank goodness they didn’t all disappear, quite, with my ancient hard drive – and have been reminded of the jeweller George Frederick Kunz’s excitement in 1885 when what he estimated to be the finest large garnet crystal found to date in the United States, was found in a sewer. “It was discovered, strange though it may seem, in the midst of the solidly-built portion of New York City” below W35th Street (between Broadway and Seventh) by a labourer who was digging for a sewer. It had not, incidentally, been lost in the sewer – garnets were evidently simply part of the bedrock of Manhattan. 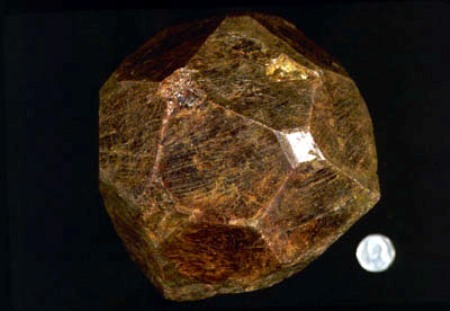 It was almandine, which is a nice way of saying purply-brownish, “weighed 4.4 kg, and was partly a trapezohedral shape”. Trapezohedral is the kind of description you skip over with ease, initially, thinking you know what it refers to, then in my case at least you realise you don’t have the first idea. Wikipedia describes it as ‘the dual polyhedron of an n-gonal antiprism” which didn’t help, but the illustration below is a good way to picture it. Since dubbed the “sewer garnet” it is now, apparently, part of the seal of the New York Mineralogical Society and I’m told by one of my very first blog readers (thanks!) that it can be seen at the American Museum of Natural History in New York in a place in the gallery that isn’t that obvious… so please get hunting, and let me know if you find it. You can find a few more of my random and unused notes on garnets on my new, to-be-expanded, “garnets” page here. Also, if you’re interested in the sewer garnet, the John Betts website has a good account of some of the happy and unhappy controversies and correspondences its discovery inspired. This entry was posted in Books, Garnets, Jewels, Stories, USA and tagged crystal, garnet, Kunz, sewer, USA on December 3, 2010 by victoriafinlay.